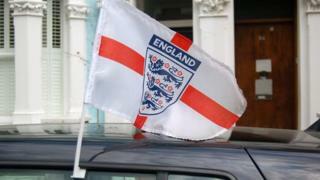 Patriotic postal workers looking to show their support for England will not be allowed to fly flags on their delivery vehicles during the World Cup. The Royal Mail has banned all flags and stickers from being put on trolleys, bikes, vans and lorries. It says they could distract drivers or "pose a potential hazard to other road users", should they come loose. But the Royal Mail is not banning flags altogether - they will be allowed to be displayed in offices. Which World Cup team should you really support? The company said the policy was in place for previous World Cup tournaments. "Flags should not be flown on vehicles as Royal Mail has a duty of care both to all employees and to members of the public," a statement said. "No other flag or insignia should be carried next to the Royal Mail brand and insignias." The tournament begins on Thursday, with Russia v Saudi Arabia kicking off at 16:00 BST. England's first game is on Monday evening, against Tunisia. Some have called Royal Mail's decision "unpatriotic", while others said it was the right decision, as they were professional vehicles. Driving with a flag attached to a vehicle is legal. But, in accordance with the Highway Code, it must not obscure the driver or another road user's vision, and it should be fixed securely to the vehicle. It may cost drivers at the pump though - with some experts claiming an average car with two flags attached burns a litre of fuel more per hour than those without.